Event #31 ($1.5K PLO Hi/Lo) finished up last night and Jarred Graham won his first WSOP bracelet. When day #3 started it looked like Graham wasn’t going to even make the final table. He had the short stack out of the 13 remaining players on the final day. Within 20 minutes of starting the final day Graham doubled up against Grzegorz Derkowski. The first four players to be knocked out of the tournament on day #3 were Derkowski, Andy Seth, Mel Randolph, David Booker and Stephen Johnson. Perry Green (9th) was the first player to be eliminated once the final table started. Green had the chip lead to begin the day, but it didn’t take long to lose his chips. Joao Simao (8th), Eric Rodawig (7th) and Loni Harwood (6th) were the next three to go. Gabriel Blumenthal (5th) was knocked out next and then Graham eliminated Noomis Jones (4th). When the action went 3-handed the remaining players were close in chips. Barry Greenstein made a good run at another bracelet, but lost in third place. Once heads-up action started Graham had roughly a 4/1 chip lead over Marco Johnson. It looked like Johnson would finish in 2nd place again at the World Series of Poker and that’s what happened. 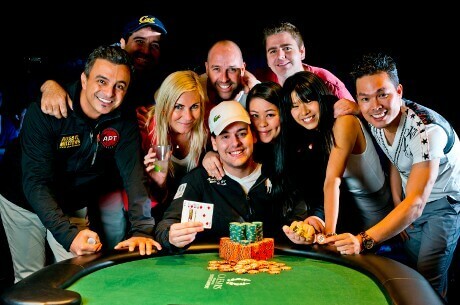 Graham finished off Johnson and claimed the bracelet.